The legal case of the alleged Sept. 11 terrorists is slowly grinding its way through a war court at the U.S. naval base in Guantanamo Bay, Cuba. 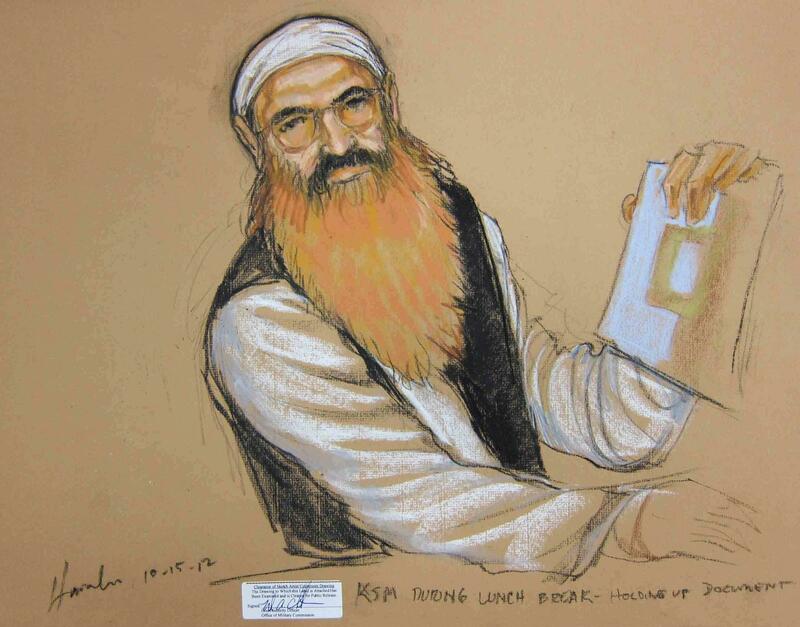 Khalid Sheikh Mohammed — accused of being the mastermind of the Sept. 11 attacks — holds up a piece of paper in this artist's sketch during a court recess at a pretrial hearing at Guantanamo Bay in October 2012. This Sunday marks a dozen years since Khalid Sheikh Mohammed was captured in Pakistan — and seven years since Brig. Gen. Thomas Hartmann announced formal charges against him, alleging Mohammed was the mastermind of the Sept. 11 attacks. Ever since, the United States has been working to try him and four other men on death penalty charges at the U.S. Naval Base in Guantanamo Bay, Cuba. Now, one of the biggest cases in U.S. history may also become the longest running. And it could be years before what's being called the "forever trial" even reaches the trial stage. At 7:50 a.m. on a sultry morning this month, on the small tip of Cuba the U.S. has occupied since 1903, the five defendants in the Sept. 11 case are being escorted — for the first time in half a year — to a courtroom perched at the edge of a sprawling tent city. Everything about the place looks provisional, as if it could all be packed up and shipped off in a week. But defense attorney James Connell says things in this military commission proceeding are, in fact, barely beginning. "Not only is there no end in sight to the military commission, there's no middle in sight," he says. That quickly became clear in the courtroom. No sooner had things gotten underway when a new twist in the case shut things down. This time, the problem was a new interpreter on one of the defense teams. A defendant told the judge he had a problem with the interpreter: He'd seen the man before — at a secret CIA-run interrogation center where he'd been held. The prosecution later confirmed that the man had indeed worked for the CIA. Defense lawyer Walter Ruiz says such incidents are one reason it's taking forever for this case even to reach the trial stage. "It breeds issues for us to litigate because it's a system that is so flawed, it lends itself to greater litigation," he says. And that's fine with Ruiz; he's trying to prevent his client, Mustafa al-Hawsawi, from being executed. But the chief prosecutor, Gen. Mark Martins, wants things to move faster. Despite the delays, he defends the military commission system as fair. "[On] effectiveness, I'm going to let other people decide that, but it is the only process in which we can proceed toward a full and open trial of these defendants," Martins says. The U.S. government has been forced to revise the military commissions twice because of legal flaws. They've produced only six convictions, half of which have been overturned. When President Obama tried moving the case to a federal court in New York City, Congress prohibited any transfer of Guantanamo detainees to the U.S. Since then, the case of the Sept. 11 defendants has gone almost nowhere. One reason: The court has few legal precedents to go by, so nearly every issue that comes up causes another delay. "It's just one fiasco after another, one more collapse of a system they've been trying to prop up as fair," says Cheryl Bormann, a lawyer for one of the accused. "And each time we come down here, there's another brick removed from the wall that the government claims is the wall of fairness — the thing is collapsing." Bormann is part of the contingent of defense lawyers, prosecutors, court reporters, relatives of Sept. 11 victims, journalists and a military judge the Pentagon airlifts from Washington to Cuba for a week or two of courtroom hearings. Last April, those sessions practically shut down after defense lawyers were informed the FBI had gathered information from a member of a defense team. "He was allowed to remain on our team without us knowing it for another five months," says James Harrington, that team's lead lawyer. "And he operated within our team, and we don't know what it is that he did, what it is that he turned over, and you find out about it afterwards. If you want to talk about sabotage, that's a pretty good definition of it, I think." Last month, in an attempt to speed things up, the Pentagon issued an eye-popping order: It instructs the military judges presiding in this and two other cases underway in Guantanamo to move down to the naval base and stay until there's a verdict. David Nevin, Khalid Sheikh Mohammed's lead attorney, says this is "a pretty clear example of what's called unlawful command influence." Nevin has asked the court to strike down that Pentagon order; he says it puts undue pressure from above on the judge to act in haste. "This is the military commission telling the judge, 'I don't like what you've been doing, I don't like your decisions, you're not moving fast enough, handle these cases in a different way,' " Nevin explains. On Wednesday, the military judge presiding in the Sept. 11 case appeared to agree. He ordered an immediate halt to the proceedings until the Pentagon withdraws the order to relocate — an order that, if left standing, would detain the judge himself in Guantanamo along with the defendants until this never-ending trial is over. This Sunday marks a dozen years since Khalid Sheikh Mohammed was captured in Pakistan. And seven years ago, Air Force Brigadier General Thomas Hartmann, a Pentagon lawyer, announced formal charges against him. THOMAS HARTMANN: The charges allege that Khalid Sheikh Mohammed was the mastermind of the 9/11 attacks. WERTHEIMER: Ever since, the United States has been working to try him and four other men on death penalty charges at the U.S. naval base in Guantanamo Bay, Cuba. But the trial has not even started. And the delays continue to multiply. 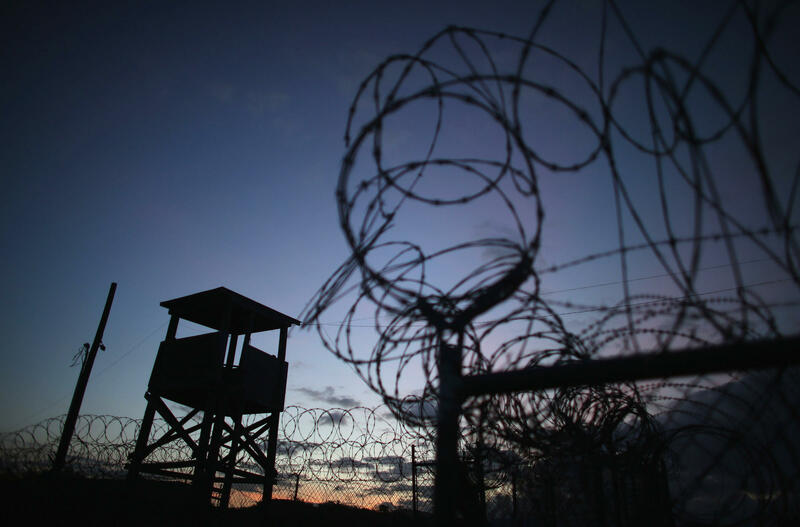 NPR's David Welna is just back from Guantanamo and has this report on what some are calling the forever trial. DAVID WELNA, BYLINE: At 10 minutes to 8 on a sultry morning earlier this month, a bugle blares over loudspeakers. It's the same every morning on this small tip of Cuba the U.S. has occupied since 1903. What's different about this morning in Guantanamo is that for the first time in half a year, the five defendants in the 9/11 case are being escorted to a courtroom perched at the edge of a sprawling tent city. Everything about this place looks provisional, as if it could all be packed up and shipped off in a week. But defense attorney James Connell says things in this military commission proceeding are in fact barely beginning. JAMES CONNELL: Not only is there no end in sight to the military commission, there's no middle in sight. WELNA: That quickly became clear the courtroom. No sooner had things gotten underway when a new twist in the case shut things down. This time, the problem was a new interpreter on one of the defense teams. A defendant told the judge he had a problem with the interpreter. He'd seen the man before at a secret CIA-run interrogation center where he'd been held. The prosecution later confirmed that the man had indeed worked for the CIA. Defense lawyer Walter Ruiz says such incidents are one reason it's taking forever for this case even to reach the trial stage. WALTER RUIZ: In essence, it breeds litigation. It breeds issues for us to litigate because it's a system that is so flawed. It lends itself to greater litigation. WELNA: And that's fine with Ruiz. He's trying to prevent his client, Mustafa al-Hawsawi, from being executed. But the chief prosecutor, General Mark Martins, wants things to move faster. Despite the delays, he defends the military commission system as fair. MARK MARTINS: Effectiveness - I'm going to let other people decide that. But it is the only process in which we can proceed toward a full and open trial of these defendants. WELNA: The U.S. government has been forced to revise the military commissions twice due to legal flaws. They've produced only six convictions, half of which have been overturned. When President Obama tried moving this case to a federal court in New York City, Congress prohibited any transfer of Guantanamo detainees to the U.S. Since then, the case of the 9/11 defendants has gone almost nowhere. One reason - this court has few legal precedents to go by, so nearly every issue that comes up causes another delay. Cheryl Bormann is the lawyer for one of the accused. CHERYL BORMANN: It's just one fiasco after another, one more collapse of a system they've been trying to prop up as fair. And each time we come down here, there's another brick removed from the wall that the government claims is the wall of fairness. The thing is collapsing. WELNA: Bormann is part of the contingent of defense lawyers, prosecutors, court reporters, relatives of 9/11 victims, journalists and a military judge that the Pentagon airlifts from Washington to Cuba for a week or two of courtroom hearings. Last April, those sessions practically shut down after defense lawyers were informed the FBI had gathered information from a member of a defense team. James Harrington is that team's lead lawyer. JAMES HARRINGTON: He was allowed to remain on our team without us knowing it for another five months. And he operated within our team. And we don't know what it is that he did, what it is that he turned over. And you find out about it afterwards. If you want to talk about sabotage, that's a pretty good definition of it, I think. WELNA: Last month, in an attempt to speed things up, the Pentagon issued an eye-popping order. It instructs the military judge that's presiding in this and two other cases underway in Guantanamo to move down to this naval base and stay until there's a verdict. DAVID NEVIN: It's a pretty clear example of what's called unlawful command influence. WELNA: David Nevin is Khalid Sheikh Mohammed's lead attorney. He's asked the court to strike down that Pentagon order. Nevin says it puts undue pressure from above on the judge to act in haste. NEVIN: This is the military commission telling the judge, I don't like what you've been doing. I don't like your decisions. You're not moving fast enough. Handle these cases in a different way. WELNA: Yesterday, the military judge presiding in the 9/11 case appeared to agree. He ordered an immediate halt to the proceedings until the Pentagon withdraws the order to relocate, an order that if left standing, would detain the judge himself in Guantanamo along with the defendants until this never-ending trial is over. David Welna, NPR News.